This week we have another tournament that starts on Wednesday night (in the eastern time zone) and has no cut. I’m looking to have another great tournament to follow up last week’s winning results (see below for full details). If you missed last week’s article, click here to read. There was no cut, but each one of my core plays finished in the top 21, including two tied for 10th, and a 14th place. 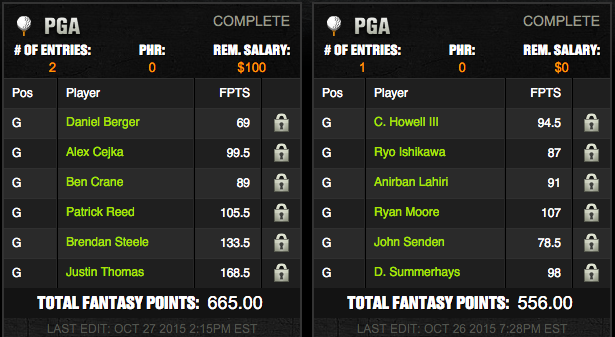 I would love to replicate those results this week, and below are four golfers I will be targeting for my GPP lineups. Remember, these are targets for tournaments and not necessarily cash games, as they can be volatile. I’m shooting for high risk, high reward. Bubba hasn’t played since the BMW Championship but I think that will leave him more rested than rusty. He has played in this tournament two other times; winning it last year (-11) and posting a -14 the year before. He’s also ranked 4th in the world and does not shy away in deep fields. Watson was 1st in P5s, 1st in SGTG, and 3rd in BoB% last season – that’s incredible. He comes at a hefty price tag but still almost 2k less than Rory and 1.5k less than Spieth. I’ll be all over Bubba as he tries to defend his title. I used Reed last week (not as a core player) and I’ll be on him again this week. Reed has been playing excellent golf lately and he has statically been one of the better golfer over the past year: 33rd BoB%, 10th P5s, 41st SGTG, and he’s steady on the greens. He’s steadily been improving and is currently ranked 19th in the world. I look for Reed to contend this week following up a solid tournament last week. I didn’t use Na last week which wasn’t the best choice but luckily it didn’t burry me. I can’t ignore him this week, even though he’s given away three straight tournaments he’s playing unbelievable golf – 3rd, 2nd, 2nd, 10th – his last four tournaments. Na is 7th in BoB%, 14th in P5s, 2nd in SGTG, and if he can figure out his putting who knows how low he will start scoring. Na is 71st in stroke gained putting and if he can improve on that and continue his approach to the green, he will win this tournament. I used Summerhays as a core player last week and he didn’t disappoint so let’s try it again this week! He finished 14th last week even after a slow first round and with his stats and recent form I love Daniel at his price. He’s currently 43rd in BoB%, 51st in P5s, and 32nd in SGTG – not bad for only $7300 on Draftkings. He has no history at this course but I’m confident enough in his current game to use him and he really leaves room for you to cram in some of the more expensive options this week.